Six senior officials of the People’s Bank, Chief Internal Auditor Ms. N. S. Thilakarathna, AGM, Marketing and Product Development, Chandrasiri Fernando, AGM, Central Province, R.M.S.B. Rathnayake,, Actg. AGM, Inspection and Investigation, Lalith Withana, Chief Manager, SME, Wickrama Narayana, and, (Senior Manager Inspection and Investigation, Ms. Ashoka Pathirana were conferred FIB (Sri Lanka) status. 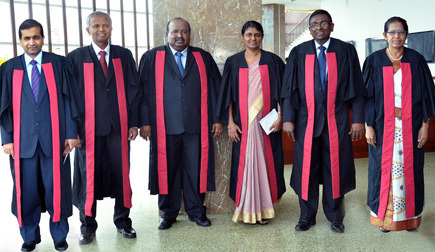 Signifying the invaluable contribution by officers of the People's Bank towards shaping the banking and financial services landscape in Sri Lanka, the Institute of Bankers of Sri Lanka (IBSL), the apex body that represent the country's banking sector conferred Fellow Membership on six veteran banking professionals of the People's Bank at the Institute's annual graduation ceremony at the BMICH recently. Central Bank Governor Ajith Nivard Cabraal, Higher Education Ministry, Secretary, Dr. Sunil Jayantha Navaratne and several invitees comprising business leaders, industry experts, members of the academia and fellow bankers, witnessed nine senior bankers of the country, six from the People's Bank being recognised with the award of highest professional credentials in banking; Fellow Member Status by IBSL - the only accredited professional body in the banking sector that is mandated with the authority to conduct professional banking education and award banking qualifications in Sri Lanka.